From the East, it displays a gentler profile, its slopes rising from the limestone plateau that houses Gaping Gill, a one-time holder of the title of largest cavern in Britain. For the walker with time to spare, the environs of the 724m (2,375ft) fell reward exploration. For those with more of a spring in the step, a swift ascent will provide plenty of work for limbs and lungs. As well as Gaping Gill, there are extensive cave and pothole systems on the north-west flanks, including Meregill Hole, a series of innocuous-looking slits on the 390m contour that drop to a depth of 160m (520ft); and Great Douk Cave, the entrance to which sits in a collapsed cavern, which walkers can access carefully by a stile through the surrounding wall. On the eastern slopes is Juniper Gulf, a 130m (430ft) deep slit secreted away on the boggy moorland of the Allotment. Long Kin West Pot and a series of impressive shake holes grace the mountain’s south-eastern flank. Extensive limestone pavements occur on White Scars and Raven Scars on the West of the hill, and Moughton Scars and Sulber to the East. Most of Ingleborough’s caves are the domain of experienced potholers rather than walkers, but there are showcaves at White Scars and Ingleborough Cave where visitors can pay for underground trips. 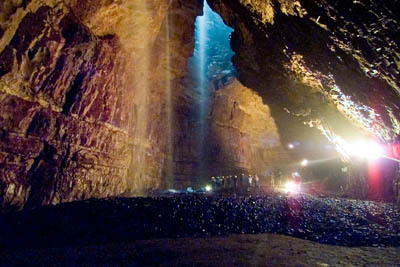 Twice a year, potholing clubs rig up a winch over the entrance to Gaping Gill and non-speleologists can make the effortless trip 105m (360ft) to the floor of the cavern, which is reputed to be big enough to swallow York Minster. The extensive carboniferous limestone – the compressed shells and bodies of billions of sea creatures and mud in the tropical sea between 350 million and 325 million years ago – is topped by the Yoredale Series, with sandstone layers, another layer of thinner limestone appearing around the 600m mark and finally a cap of millstone grit. The varied rate of weatherng has given the hill’s western escarpments their distinctive stepped appearance. 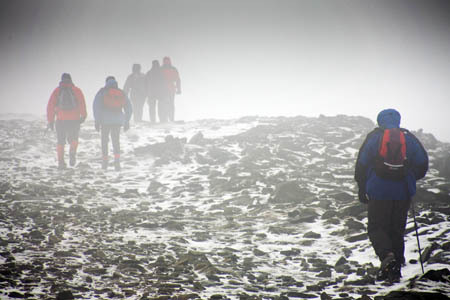 The summit is a wide, gently sloping plateau, 330m by 350m and can be a confusing place in bad visibility. Taking a compass bearing is a wise precaution when searching out the required path off the summit. The plateau itself is home to a cross shelter with a view indicator, so you can put a name to the Lakeland and Dales fells and other distant landmarks. There is also an Ordnance Survey triangulation pillar, the remains of a round tower or hospice completed in 1830 and immediately demolished in a drunken frenzy by the celebratory party at its opening. A large, untidy cairn near the cross-shelter grows weekly and the remains of the perimeter fortification wall of the Iron Age fort that once graced the hill can be seen in a collapsed state at various points of the plateau’s edge. There are five main paths up the fell, and most of the maintained paths present no technical difficulty, though the route from Chapel-le-Dale is steep above High Lot and requires care in the wet and when icy, especially when descending. Wet limestone is also particularly slippery and the route from Horton in Ribblesdale via Sulber Nick has extensive walking on limestone. 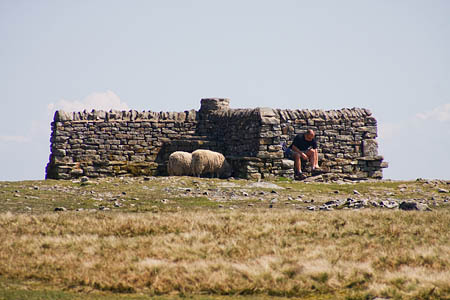 Weather on the summit can vary from the severe to the sublime – from full winter kit required to shorts and t-shirts on the warmest summer days. As always, go prepared for the worst weather you might expect. 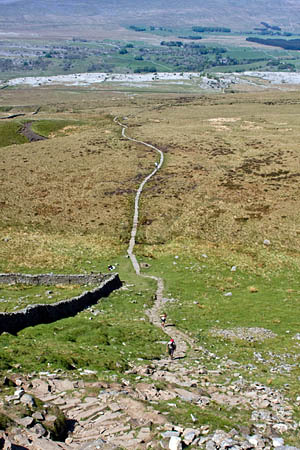 In addition to the maintained footpaths, there are many other routes up Ingleborough, via the open access land that encompasses the hill. 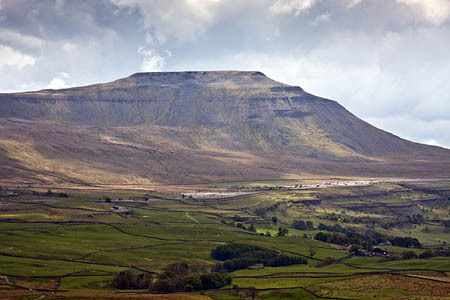 It is also possible to combine the ascent of Ingleborough with a walk along the broad ridge on to its subsidiary peaks of Simon Fell and Park Fell. Trains serve Horton in Ribblesdale and Ribblehead, the nearest stations, which are on the Settle to Carlisle line. There is no railway at Ingleton, Newby Cote or Chapel-le-Dale; Clapham railway station, on the Skipton to Lancaster line, lies 2km (1¼ miles) south of the village. For train times, visit the National Rail website. Buses run from Skipton to Settle and from Settle to Horton in Ribblesdale. There is also a service from Kirkby Lonsdale to Ingleton. From Easter to mid-October, extra services run between Settle, Clapham and Ingleton and Ribblehead. Further details are on the Dalesbus website. Pay-and-display car parks can be found in Ingleton, Horton in Ribblesdale and Clapham, along with limited street parking. There is limited layby parking at Chapel-le-Dale, with more at Ribblehead. There is very limited parking on the verge at Newby Cote. Printable Ordnance Survey mapping for all the walks below, along with routes and exportable GPS files, are on our grough route service. With two cars, different ascent and descent routes can be combined. Alternatively, a longer walk-in from Ribblehead station via the ridge route which includes Park Fell and Simon Fell, can be rounded off by descending via the Sulber route to Horton in Ribblesdale station. Confident navigators can avoid descending by the same route as the ascent by making their own route on the extensive open access land surrounding the summit plateau, though the northern and western crags of The Arks and Black Shiver are to be avoided as descent routes. A route for the more adventurous, with a section of scrambling up the gully of Falls Foot – no exposure but steep slope, plus navigation needed to find way through the limestone crags of Raven Scar and across the moorland of Tatham Wife Moss. No footpaths.